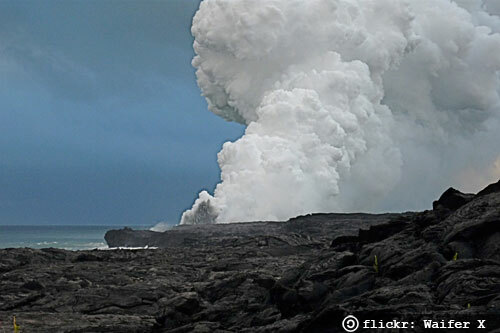 The town of Kalapana, Hawaii on the Big Island is the site of an oceanside town that was basically destroyed when a lava flow came through in 1990. Though a few residents remain, the area is now primarily known as a lava viewing site on the Big Island. For the past several years, Big Island residents and visitors have been able to see active lava flows in this area in addition to the viewable lava flows within the Hawaii Volcanoes National Park. The County of Hawaii's Civil Defense Agency maintains a lava viewing area here. Up to date information about lava viewing here can be obtained by calling the county's lava hotline (808-961-8093). The viewing area is open daily from 2 pm till 10 pm (but cars are only allowed in up until 8 pm). Unlike lava viewing within the national park, where visitors are allowed to get quite close to accessible surface lava flows, this viewing area is outside of the park and the Civil Defense Agency keeps visitors further away from the action. 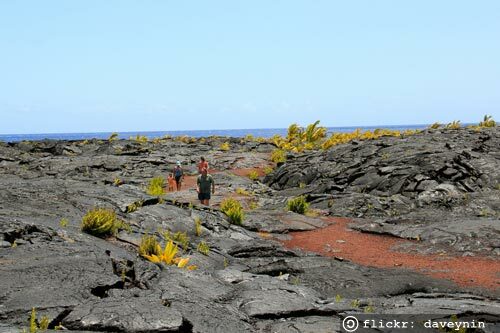 However, the conditions at this viewing area are similar to viewing lava at the end of the Chain of Craters Road within the park—it involves a short hike over lava fields so visitors should wear good closed toe shoes and bring plenty of water. The lava viewing area is about 45 minutes south of Hio. Take Highway 11 to the town of Keaau and turn onto Highway 130 heading south. Access to the viewing area is at the end of Highway 130. Civil Defense supervises the parking area where portable toilets are also available. When lava is flowing, during the day you'll mostly see steam and maybe the red glow of lava. After dark, the lava itself is more clearly visible. Binoculars really add to the experience since the viewing area is quite a ways away from the actual lava flow. Of course, what you'll see on any given day depends on current conditions. While this is a great area for viewing the current lava flow at a distance, in order to get the full Hawaii volcano experience, you'll want to be sure to visit the Hawaii Volcanoes National Park too, where you'll find many more volcano viewing opportunities of all kinds.